Looming at an elevation of 8,586 meters on the boundary of Nepal and the Indian state of Sikkim, Kanchenjunga or Kangchenjunga is world's third highest peak that further embraces four of her sister peaks, the Kangchenjunga West at 8,505 meters, Kangchenjunga Central at 8,482 meters, Kangchenjunga South at 8,494 meters and Kangbachen at 7,903 meters. The horizon simply stands out from the base camp vicinity. 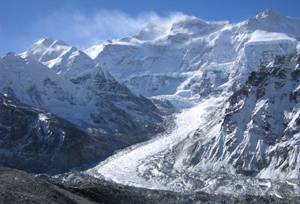 Kangchenjunga, was first climbed in the year 1955 by two Britishers, Joe Brown and George Band. But the summit still remains virgin as it is considered as one of the holy peaks, worshipped by the locals of Sikkim. The Kangchenjunga range protects the Kanchenjunga Conservation Area in Nepal, Kanchenjunga Biosphere Reserve, Barsey Rhododendron Sanctuary, Fambong Lho Wildlife Sanctuary, Kyongnosla Alpine Sanctuary, Maenam Wildlife Sanctuary, Shingba Rhododendron Sanctuary, Pangolakha Wildlife Sanctuary located in Sikkim AND Jore Pokhri Wildlife Sanctuary, Singalila National Park, Senchal Wildlife Sanctuary, Mahananda Wildlife Sanctuary, and Neora Valley National Park located in Darjeeling. The Sikkim and Kanchenjunga Trek, which is one of the alpine treks in Sikkim, passes through the vast biosphere of Sikkim that is a home to several species of flora, including medicinal plants, and fauna. Further, the rich culture of Sikkim reflecting from the tribal villages, home to the Lepchas, Nepalis and Bhutias, is worth experiencing once in a lifetime. The Sikkim and Kanchenjunga Trek commences from Yuksom, which is at an elevation of 1,780 meters, and follows a gradual climb to Tshoka at 2,743 meters through the dense tropical forest of pine, bamboo, fir, oaks and flowering trees like magnolias and rhododendrons, which is a home to several wildlife and bird species at different altitude. Thereafter the trek turns to Dzongri via a steep ascend to the alp of Phedang at 3,650 meters. There is a day of acclimatization at Dzongri and one can reach Dzongri Top and take in the panoramic view of Kabru at 7,353 meters, Ratong at 6,678 meters, Kanchenjunga at 8,586 meters, Koktang at 6,147 meters, Pandim at 6,691 meters and Narsing at 5,825 meters. Towards the west, the Singalila Ridge, which separates Sikkim from Nepal, can be seen. The trail continues to Goecha La en route to Thangsing at 3,800 meters and Lake Samiti that encircles a beautiful alpine meadow. 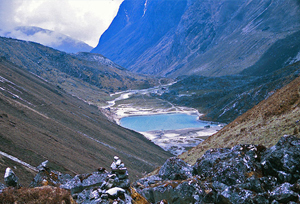 The trek to Goecha La continues with a gentle gradient till you hit the glaciated tracks. The vicinity is further embellished with several small glacial lakes. The trek downhill to Yuksom follows through Lam Pokhari at 4,230 meters and heads to Labdang at 2,000 meters via Kasturi La, which is at an elevation of 4,500 meters. The trail leads off at Tashiding and thereafter wheels to Gangtok via Martam. 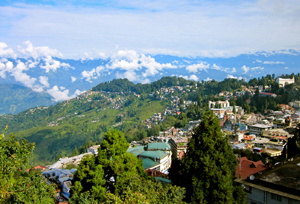 We will drive to the Darjeeling, which is approximately a four hour journey. During the journey, witness the beautiful villages and lush green tea plantations. Early in the morning, visit the Tiger Hill to see the magnificent sunrise. Later, get ready for a visit to the popular Ghoom monastery that houses the idol of the Maitreya Buddha (the coming Buddha). Afterwards, visit the Himalayan Mountaineering Institute and tea plantations. During the course of the journey, we will visit the Pemayangtse monastery, located at 2800m. 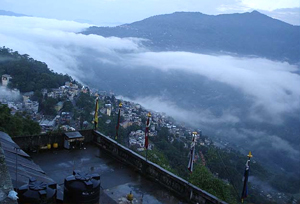 It is one of the oldest gompas in Sikkim. We will trail up to the Rathong valley after crossing through the thick and semi-tropical forests. Later, we descend to Tsoska, a small awe-inspiring Tibetan village. From here, we get a great view of the Himalayan and Kanchenjunga peaks. We trail on the serpentine routes through the temperate forests to reach Phedang. After reaching at an altitude of 300m, we follow the ridge to reach Dzongri, which serves as an excellent pasture region for the Yuksam yaks, especially between the months of April and October. If the health of the trekking group is in excellent condition, then we will trek northwest to the Dzongri over the Rathong glacier and reach the beautiful peaks on the border with Nepal. Besides, this trekking route, we also have another very short trail that can be organized towards the Dzongri Peak (4320m). 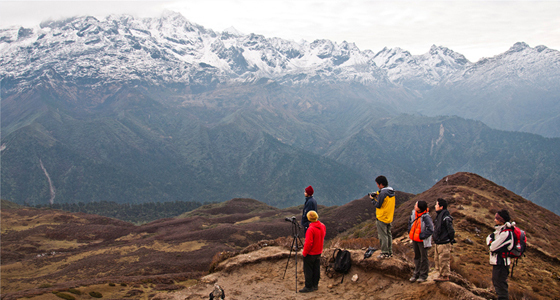 From here, you can enjoy a breathtaking view of Mount Kanchenjunga (8586m), the third highest summit in the world. We walk through rhododendron forest to reach the glacial Prek river. We will set up our camps on the lush green grass of Thangshing. From here the southern ridge of Kanchenjunga and the Onglakhing glacier can be seen directly. Today, we trail to the west side of Pandim to reach Zemathang. 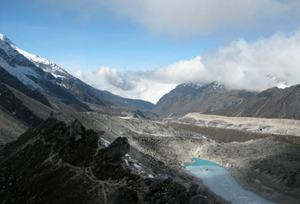 We take trail towards the Onglakhing glacier and climb up to the shores of the Samity lake. The lake is a source of Prek river from where the Forked Peak, Kabru North, Gocha Peak and other snow-capped peaks are clearly visible. Early in the morning, we trek to the Gocha La pass and see Kanchenjunga peak and Talung glacier. After a steep descent, we stroll through alpine regions and pass by small pristine lakes. An easy walk, in an atmosphere that goes on to become more humid and heavier as we trek further. En route, we visit the Tashiding monastery that is located on the top of hill between two rivers. We visit Rumtek monastery that is well-known for its traditional Tibetan art. Here the visitors can also seek the blessings of the almighty. Today, we will visit the Orchid Sanctuary to the 454 orchid species. Later, we will be visiting the To Enchey and Do Drul monasteries, and the Tibetology Institute that includes one of the great collections of 'thankas' and other religious works in the world. Day 18: Gangtok - Bagdogra (by car) - Delhi (by plane).